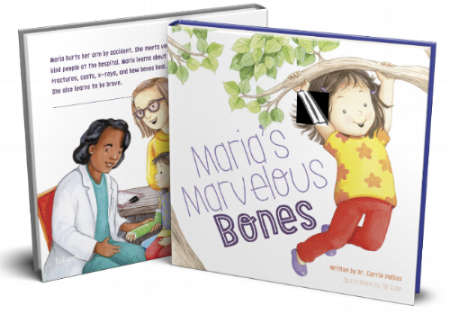 Written by Dr. Carrie Kollias, an orthopaedic surgeon who specializes in the treatment of children, Maria’s Marvelous Bones educates young readers about bones as well as about the diverse members of the healthcare team who work together to help heal bones. 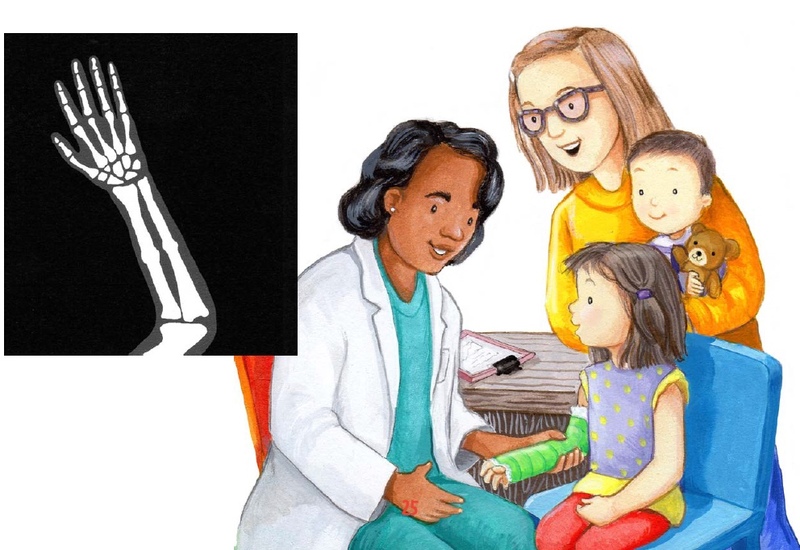 After an accident, a girl finds support, comfort, and care from kind medical staff in Kollias’ debut picture book. Maria and her brother are jumping on the couch when she falls and breaks her arm. At the hospital, she encounters caring doctors and nurses who provide her with explanations to help her feel safe. For example, a nurse uses a blood pressure cuff to see “how well Maria’s HEART was working to pump blood around her body.” Maria also receives an IV and x-rays, and she receives medicine that puts her to sleep so that a doctor can make her arm straight. 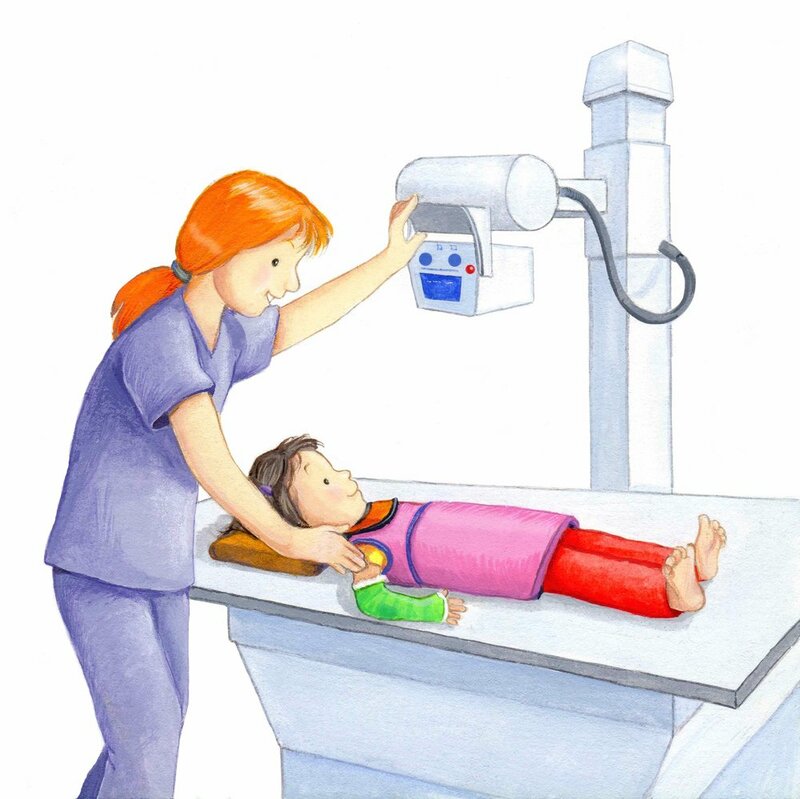 The author, an orthopedic surgeon, depicts medical processes using child-friendly language (“an x-ray is a picture of bones…taken with a special camera that can see through skin”). Overall, the story takes readers on a realistic journey, which concludes when Maria gets her cast removed. It also introduces educational elements, including anatomical terms: “Dr. Anna said Maria’s body was making ‘CALLUS’…a big ball of bone glue. The glue had calcium in it, to make…broken bones heal.” Guile’s (Bear Picks a Pumpkin, 2018, etc.) top-notch illustrations are charming and colorful, with diverse characters. They emphasize friendly faces, which will be particularly encouraging to young patients in similar circumstances. A wonderful resource to help prepare children for medical intervention after an injury. Amazon.co,uk 🇬🇧 buyers: note that this book is a print on demand book so it will appear as "temporarily out of stock" in both countries but will not take long to receive. Dr. Carrie Kollias is a Canadian orthopedic surgeon who specializes in the care of children. She has a very helpful husband and two young kids who listen to a lot of stories about bones. Gill Guile loves painting and has illustrated over 600 children’s books. She enjoys spending time with her family and playing lots of tennis.